What’s your version of the ultimate outback overnighter? Does it include sleeping under the stars? Or perhaps being surrounded by ancient landscapes? Or is Wi-Fi and a modern hotel room in the centre of town more your style? 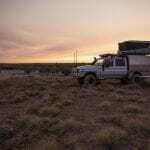 Whether you’re roughing it or relaxing in a retreat, we’ve got your sleeping arrangements sorted with these Outback options. The clue is in the name because you can’t get closer to the CBD than the Roma Central Motel. Its modern rooms give away the fact its brand-spanking new, with stylish and practical amenities that bring city sophistication to the country. Its high standards are matched with its customer service, named the best in the Outback Queensland by Tripadvisor and is one of the best rated motels in Australia. With room service on demand and alcohol served at the reception, all you have to think about is what part of Roma to explore next. If privacy, exclusivity, and luxury are a winning trio for your accommodation trifecta, this outback honeymooner’s paradise has got all your name written all over it. Nestled on the bank of the Gilbert River, you’ll find this five-star retreat hidden in the northern pocket of Outback Queensland, 472km west of Townsville and 335 clicks north of Hughenden. With only one room in the retreat, you won’t have to worry about running into other guests, and with no WiFi you can really unplug from the rest of the world. Your private hut includes a canopy bed, stocked pantry, champagne on tap, and an outdoor bathtub that overlooks the river. While it’s luxury indoors, the outdoors is calling, with abundant bushland, wildlife, and ancient landscapes on your doorstep. Whether it’s just you and your swag or your bringing along the entire family, make Cobbold Gorge your base for exploring its namesake, Queensland’s youngest gorge (at the ripe age of 135-million-years-old). 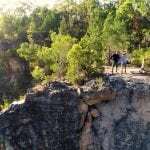 Nestled in the north-east pocket of Outback Queensland, the sandstone sanctuary of Cobbold Gorge is only accessible via tours offered by the resort, but no matter if you want to see the gorge from high above or get into the thick of it, Cobbold Gorge’s tour guides will get you there. With camping and caravanning sites, as well as ensuite cabins, you can choose your own adventure, and with an onsite restaurant and pool (including Outback Queensland’s first swim up bar), you’re set for the ultimate outback holiday. If you prefer to earn your supper, Shandonvale Station has got your work cut out for you, as the Stent-Smith family brings you along for the ride on their working farm. Perched on 15,000 acres 45 minutes north of Barcaldine, Shandonvale Station specialises in sheep, with over 4,000 of them scattered across the property. Feed kangaroos, sheep, pigs and camels, and learn the paddock to plate process first hand, whether it be chomping into lamb chops or free range eggs. What you do by day isn’t just where #farmlife starts and stops, sleep in the 100-year-old shearing shed, which has been transformed into luxury accommodation. Only 15 minutes from Biloela, the spacious Lake Callide Retreat will reel you in with its open camping and caravanning sites and self-contained cabins on the banks of Callide Dam. Known as an angler’s heaven (just look at its annual Fishing Classic) you’ll want to cast a line for a big Barra, as the dam is teeming with them (psst, the record is a 90cm catch). But it’s not just the fishing that’ll have you hooked – bring along the family for an active holiday on the water, with swimming, kayaking, and water-skiing on your doorstep. The large grassy sites are what family camping dreams are made of, with an onsite barbeque area, a kiosk offering the essentials (aka snacks), and views over the dam and national parks in the distance. 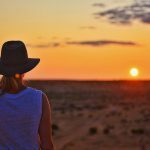 If a classic night in the outback is what you’re after, look no further than the iconic Birdsville Hotel. Built in 1884, the famous establishment has become a destination in itself. Tick it off your outback bucket list with a beer in the historic bar, which wears its history on its sleeve, or more accurately, on its walls and roof. If you find yourself 1,580km west of Brisbane, this may be your only choice of accommodation around for a private bedroom and bathroom, as the nearby caravan park has only 3 ensuite cabins which get snapped up lightning fast. With its accommodation being the only private bedrooms and showers for hundreds of kilometres around, you’ll be thanking your lucky stars that you’ve scored one of the 27 rooms. Fall in love with the heart of the Outback and treat yourself with a stay at the Longreach Motor Inn. Achieving a spot on the Gold List of Australian Accommodation, the king executive rooms let you live like one, with robes, a stocked minibar, and an espresso machine at your fingertips. Sitting in the CBD, a short stroll will get you most places around town, but if you’re more of a fill your belly and crawl home type, sit down to dine at the onsite award-winning Harry’s Restaurant. Expect a modern menu including a baked brie pot, crispy pork belly, and creamy mushroom risotto. 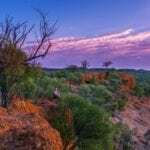 If swags and stars are your bread and butter to outback living, then pack your gear and head to the northwest pocket of Outback Queensland. Hit the road four hours northwest of Mount Isa to discover Boodjamulla (Lawn Hill) National Park, an oasis in the outback. With its insta-worthy winding waterways through towering gorges, walking trails through its dense forestry, and World Heritage-listed fossil sites, it’s no surprise the locals like to keep this natural wonder under wraps. Stay close to the action at Adels Grove, only 10km from the national park’s entrance. The camping area even has already set up tents if you prefer to travel light. If you can’t decide between city and country, have the best of both worlds at the Rocks Motel in Charleville. From the outside, it looks like a classic outback Queenslander, complete with wooden pailings and a wraparound verandah. Step inside and you’re met with the sleek, modern fixtures of an inner-city hotel. Wander through the manicured gardens framed with lush lawn to the onsite restaurant, On the Rocks, which serves classic Australian dishes (think steak and veggies) in a relaxed verandah setting. For a night you’ll never forget, book a room at the North Gregory Hotel in Winton and become a part of the iconic hotel’s history. Affectionately known as the Grand Old Lady, the hotel’s got history oozing from its walls. It’s got a lot of firsts to its name, including the very first performance of Waltzing Matilda by the legendary A.B. ‘Banjo’ Patterson. After a few beers in the pub, fall asleep in one of the 31 art-deco rooms upstairs, with verandahs that look out either over the town, or the hotel’s beer garden. 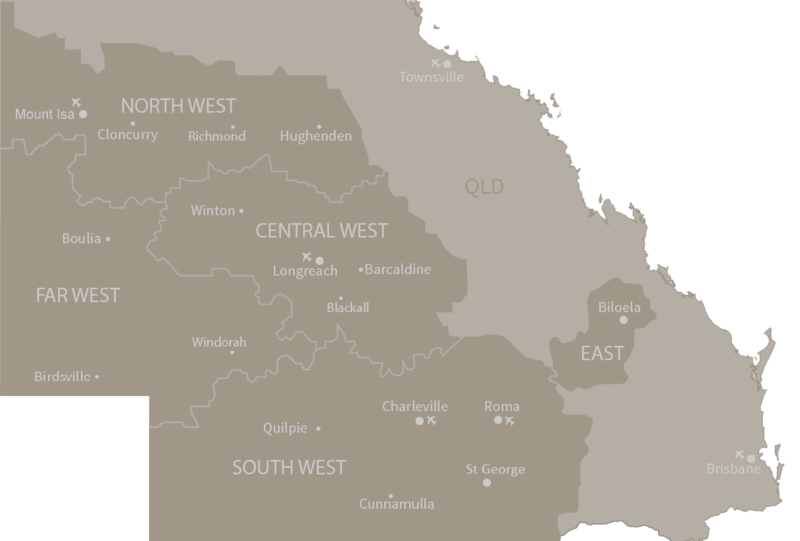 Where is your favourite place to stay in Outback Queensland? You can find more accommodation options here: https://www.outbackqueensland.com.au/accommodation/ or Wikicamps is also a popular way to find camp spots for caravans.